There are many things without which I cannot survive in the kitchen. I tried to write a post titled: “the one thing I can’t live without in the kitchen” yet I came to realize that I cannot narrow it down to one. I will try to prioritize my list in order of importance and write about these tools over the next few days. If I were forced to pick one thing I can’t live without in the kitchen it would be my knives. We have Shun Knives. These bad boys are handcrafted in Japan in the tradition of legendary samurai swords. What better to slice and dice your food with than the kitchen equivalent of a warrior’s weapon? We invested in these over time and I got most of them as Christmas gifts. To me, there is nothing more maddening than trying to prep food with dull knives. Or the wrong kind of knife. I have been forced to prep with the wrong kind of knives before and it wasn’t pretty. One time, far away from home, I had no alternative but to cube a whole butternut squash using a steak knife. If you have ever cut through a whole butternut squash, much less cubed the flesh, you understand how maddening that experience had to be! The right knife will speed your preparation process significantly. The right knife will move effortlessly through vegetables and raw meat. The right knife will be comfortable in your hand, and become an extension of yourself. I would like to believe that the “knife chooses its chef” but that would be romanticizing things a bit too much. 1. Get a chef’s knife. 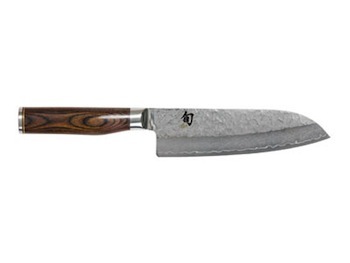 A good 8 inch chef’s knife can be procured for a modest price on Amazon.com. Be sure you get an 8 incher. This is your primary tool. You will use this more than any other knife. You will slice your onions, clean your chickens and crush your garlic with this knife. If you do not buy any other knives, this is the one I insist you purchase. Make it a good one. 2. Get a tomato knife. If you have never seen one, click here. Mine looks alot like this one. I got it at Sur la Tab it was in a basket next to the register at check out. It was 8 dollars. I use mine exclusively for cutting tomatoes. The serrated edge prevents the knife from crushing the flesh. Yes, you can use a regular knife to cut tomatoes, but why would you want to when you could be using this cute little red knife with its own blade case? Its also 10 times faster to use a tomato knife than a regular knife. I am all about speeding through prep. 3. Don’t overlook the bread knife. For most of my knives I prefer a smooth edge, but for the tomato and the bread knife there is no other way to go but serrated. I use my bread knife about 4 times a week. We like fresh bread at our house. It really is slower and more difficult to use any other kind of knife to cut through good, fresh baked, crusty bread. 4. Skip the “utility” knives. Unless you are independently wealthy and desire an absurdly thorough knife collection, skip the so-called utility knives. I have never found these knives useful. They are too small for heavy duty chopping and too long from paring. My utility knife is the sharpest one in my block because I NEVER USE IT. 5. Don’t sharpen your knives yourself. Unless you go to a class and learn how from the manufacturer. Many great knives have been ruined at the hands of one who has no clue how to sharpen them. We send ours back to Shun annually for sharpening. In fact, I believe its time for a good sharpening! Finally, if you want to go on and invest in a set of knives, the kind that come with a block, read this post to find the set that’s right for you and then make SURE the set comes with kitchen shears. Tomorrow I will write an entire post on why I love my kitchen shears. I am sure you are on the “edge” of your seat for that one!